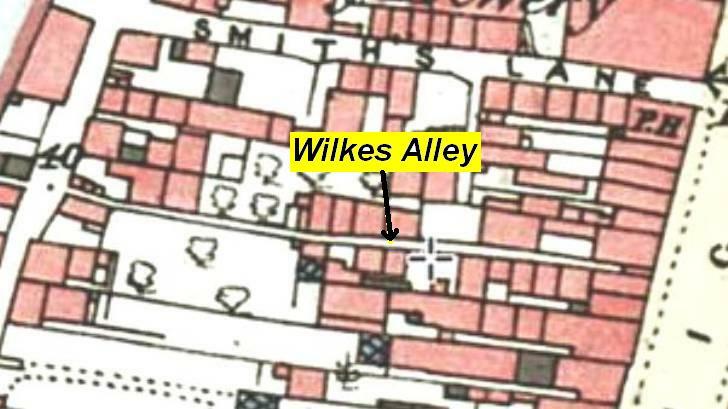 Charles Wilkes, tinsmith and brazier, took the front house (now Zitto e Mangia) in the first years of the nineteenth century, and until 1897, when Caleb became insolvent the Wilkes family ran an ironmonger’s shop there. In later years, it became a grocer’s and then a clothes shop. 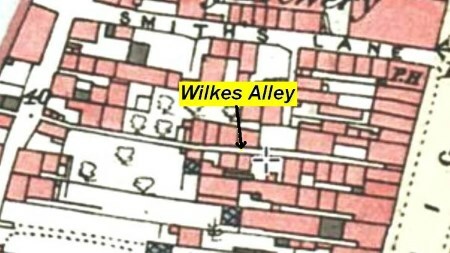 The alley was unusual in having had cottages on both sides, which meant that the dozen or so recorded there in 1900 were not quite as cheek-by-jowl as elsewhere, but they were still small and insanitary. Tewkesbury’s first cholera case was here, in the 1831 epidemic. Concern with the water supply was a recurring problem until efforts at clearing and deepening wells were at last abandoned in about 1890, and a piped water supply brought in. Only one alley house remains, and this is a substantial brick house, now housing a dry cleaners. This was not a labourer’s house. The alley is remarkable, even for Tewkesbury, for the variety of the life it saw. The people who lived in it saw triumph and tragedy, but much more of the latter. In 1814, Tewkesbury celebrated victory over France by hanging an effigy of Napoleon on a gallows opposite the Black Bear and crowning Mr Lemes, a needle-maker from Wilkes Alley, as the eighteenth King of France. They cheered him back down the High Street to the Town Hall. He was King Lemes for the rest of his life. There were sadder things. In 1856, Mary Yarnell, the young wife of chair-maker Henry, was charged with murdering their four month old daughter Diana. The child was starved to death. She was found not guilty, by reason of insanity. In 1916 another alley resident, Annie Taylor, was acquitted of murder in quite different circumstances. She was a single woman living alone. When she became pregnant, she told no-one and not knowing what to expect didn’t call for any help at the birth. She passed out, and when she recovered the baby was dead. He was found in the Swilgate. Drunkenness was an occasional crime. In 1882, John Spencer hit the headlines (and a constable) despite being an abstainer. He was fined 5s, and promised to re-join the teetotal ‘White Ribbon Army’. In 1913, three fourteen year olds pleaded guilty to stealing all the daffodils from Mrs Ruddle’s garden on the Mythe. Sentence was delayed for a week to allow their fathers to thrash them. A few years later, Thomas Lockhart, 14, was fined 2s 6d for playing pitch and toss (a gambling game). Wars took their toll on this small community. Corporal Coopey was gassed in 1915. Gunner Arthur Pitman was gassed in 1917. His brother, Sergeant Joseph Pitman was awarded the Military Medal for heroism in the Middle East. Much later, in 1944, Corporal Bernard Burford, son of Ben, once landlord of the Coach and Horses in Quay Street, was wounded in action in France. 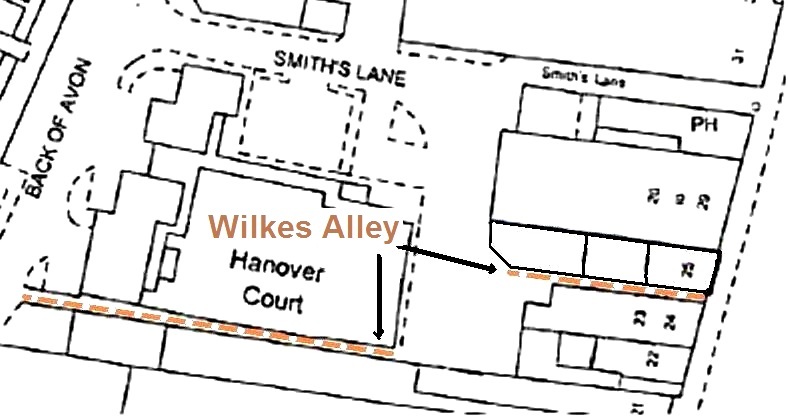 There was no clearance in Wilkes Alley, save the demolition of cottages for washhouses and toilets. 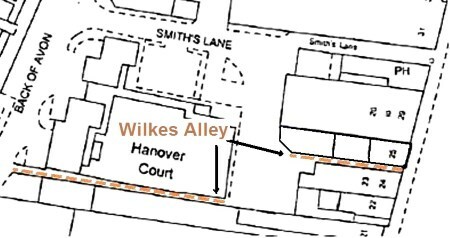 The alley survived intact until about 1965, when the buildings and footway were all swept away, to leave just a little remnant.